Low mileage this week since my weekend run was just a 5K. I still boggle at myself thinking “just a 5K” but hey, it’s the truth at this point. 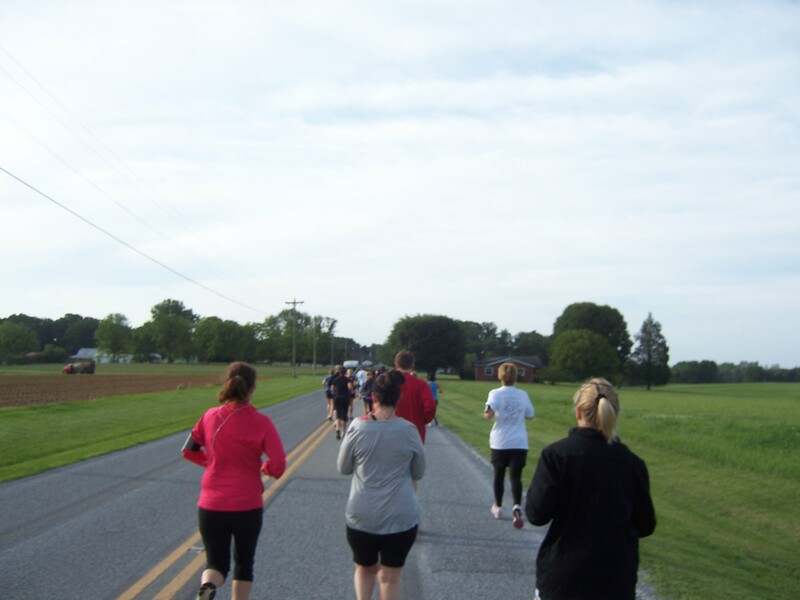 Even at my slow pace, compared to a 10K or a half marathon, a 5K is a “sprint”. I missed yoga on Wednesday because I was at an NC State Alumni function that night, and honestly after pushing too hard in RPM on Monday and then struggling through my Tuesday run, I needed a rest day. I got in all my other workouts, including some light weight lifting Saturday after my race. Well, I’m not very happy to see a gain this week, but at least it’s a small gain. But it’s another week wasted. I was averaging very close to the MFP guideline 2 pounds a week, I was at around 1.8-1.9 pounds lost a week on average, now I’m down to 1.5 pounds a week, yes I know that is still good, but my rate is slowing and I’m not close enough to my goal for it to be slowing yet. I know I’m losing inches from the way my clothes fit, but I can’t find my tape measure to verify that. This was a last minute addition to the race schedule, but local race and the registration only 15$? Sure, sign me up! Even included a shirt which I didn’t expect for that price. 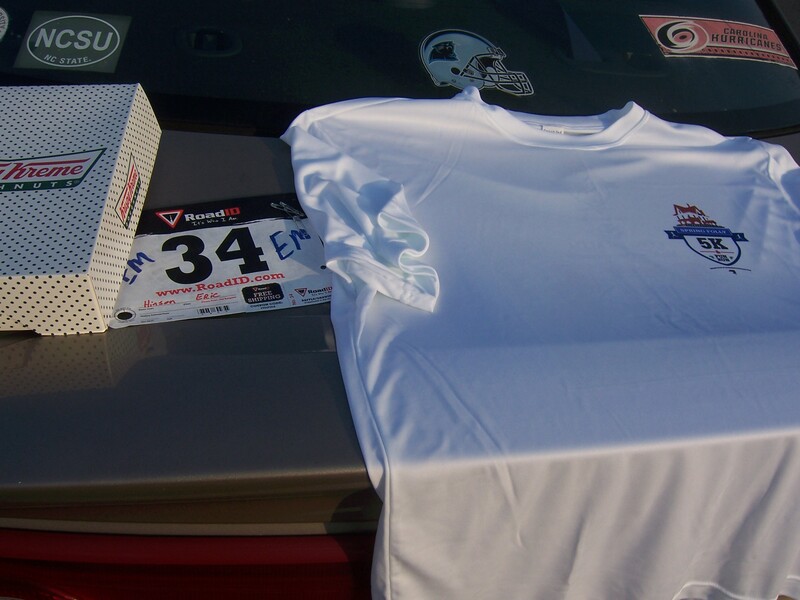 I’ve never had a race give you your post race snack before hand… Was kind of strange but as each person came up to get a shirt and their bib they gave everyone a half dozen Krispy Kreme doughnuts. Never seen that before. I’ll be honest. I was not terribly pumped up for this race. I think mostly because the last two weeks I’ve been looking ahead to Disney and not really thinking about my upcoming race schedule. 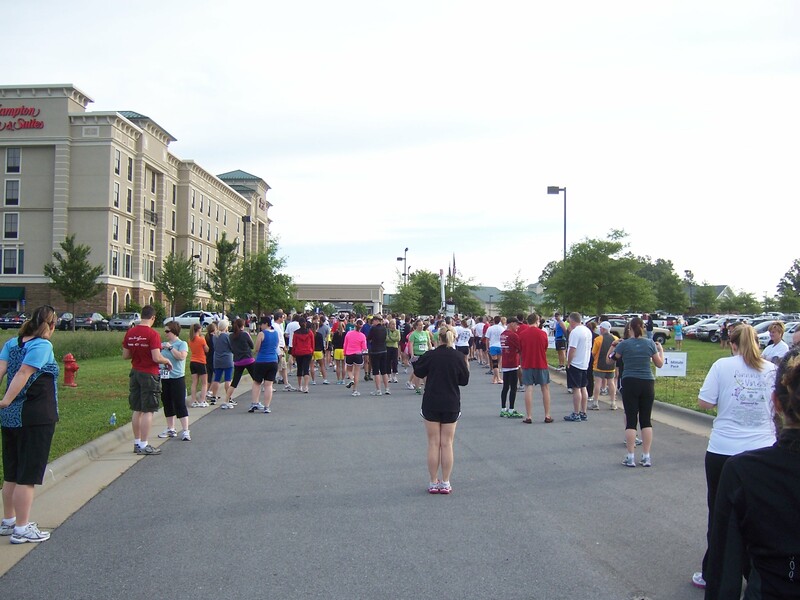 Despite running 3 (or more) miles 3 times a week, I felt unprepared for this race. Just couldn’t shake the feeling it was not gonna be a good day. The race was supposed to start at 8 according to the registration. We all head to the start line, only to find out, the kids fun run (which was just 2 little girls) started at 8 and the 5K started at 8:30. So we’re all standing around at the start line for 30 minutes looking at each other. The clouds break and the sun comes out and it starts to get hot fast. By the time the race started it was blazing hot. We get started and the crowd goes off and around the first turn at about 0.25 miles, I glance at my watch and see 9:52 pace… YIKES.. TOO FAST!!! Slow down.. slow down!! Ended up finishing the first mile in 10:30, and then faded from there. 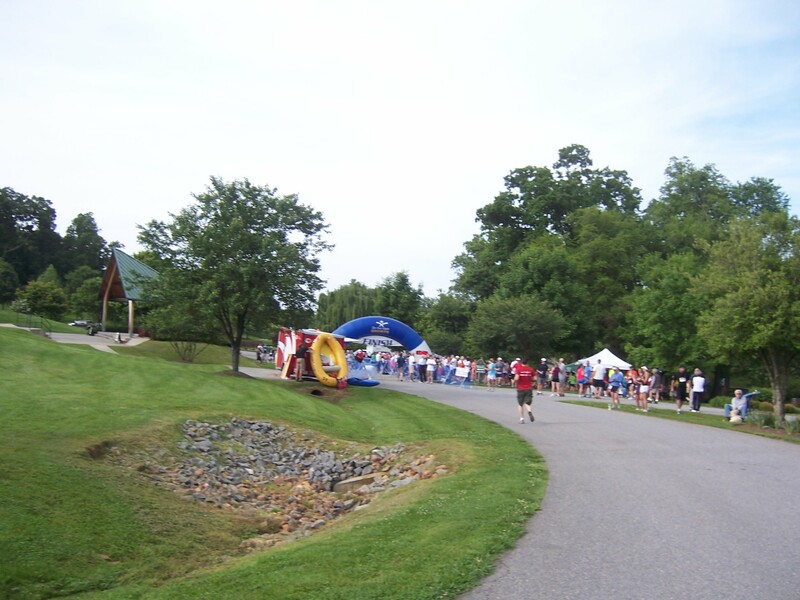 The course was very hilly and winding through neighborhoods and dodging cars and just a crazy course. I’m not gonna lie, this was a tough course. Despite drinking water all day friday and this morning, I think I got a little dehydrated, there were a couple points I felt like I might throw up. I had trouble with the water stop, little kids handing out plastic cups, filled to the brim… drank about a half a cup the first time through, second time through I choked on the water and threw it down without drinking much at all. The third mile was pretty brutal, mostly uphill, no shade, blazing sun. I was just glad to be finished. There were 4 guys in my age group, so I did not place. I also did not set a new PR, which I didn’t expect to. I was 2 minutes slower than my PR, which I reckon is not bad for feeling like I was dragging a jewelry store safe behind me the whole time. Ironically my first mile, which was advertised as “fast” was my fastest first mile, by 4 seconds, but I couldn’t hold on to that pace enough to PR. Splits 10:30, 11:43, 12:53, 12:13(0.12). Total ascent 366 feet, total descent 414 feet. Thanks to the generosity of my parents, who sent me the money to register both as a reward for my hard work and also as an incentive to keep going, I have registered for one of my premier “Destination Races”, #1 on the “Must Run List”, the Walt Disney World Half Marathon in January of 2013. Ever since I took up running 3 years ago, I’ve wanted to run Disney. Even when I was struggling to run/walk 7 tenths of a mile and was not thinking about anything longer than a 5K much less anything remotely close to half marathon distance, I wanted to “someday” run Disney. Well.. Someday will be January 12, 2013 thanks to my parents. And my brother and sister and their SO’s are coming down too for a family Disney weekend and it’s gonna be AWESOME! 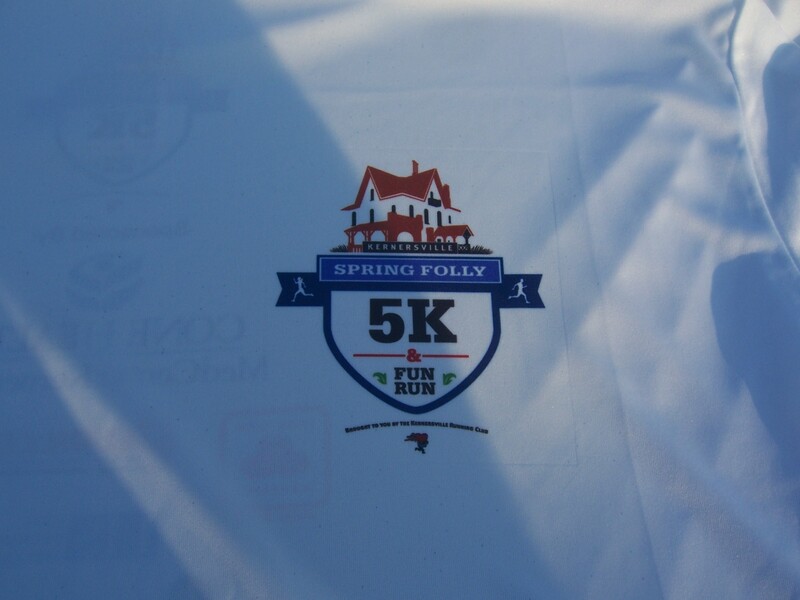 Stay tuned for pre-race details as it gets closer, and of course what will surely be an epic, picture filled race recap! You can check out the Disney Marathon/Half Marathon weekend here at runDisney. So mother nature threw me a curveball this week and flooded the greenway and scrubbed my Tuesday run. I also had some shuffling to do over the weekend, I had the wedding of a coworker to attend Saturday and what I thought was the running club breakfast run Sunday morning (turns out no one showed up) so I moved my long run to Sunday, and did some light weightlifting Saturday morning before the wedding. This opened me up to get in a repeat run Friday evening to make up for Tuesday, so I got my mileage in, but the days got shuffled around a little bit. BIG NEWS THIS WEEK: I’ve mentioned this everywhere (Facebook, DailyMile, MyFitnessPal) but I wanted to mention it here as well. 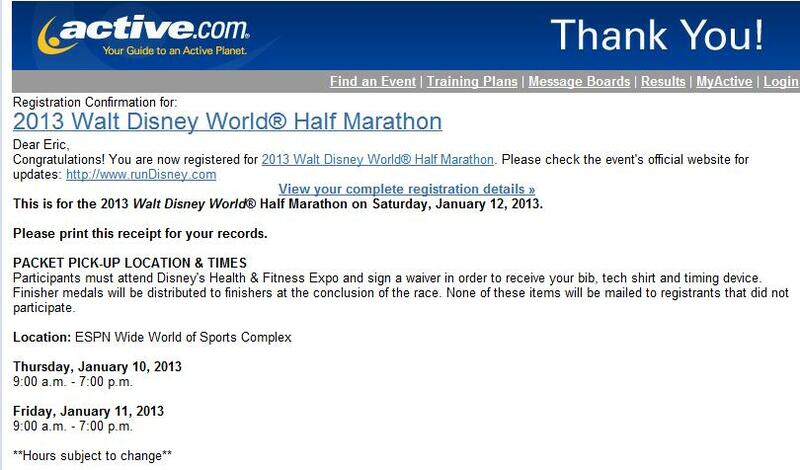 There is a new race on my upcoming schedule, the Walt Disney World Half Marathon Jan 12th 2013! My parents paid for my registration and are using their vacation club to get rooms for us and also inviting down my brother and sister for a family Disney Weekend, I am super excited! I wasn’t planning on running Disney 2013, but maybe Disney 2014, since travel expenses and everything, but my parents are taking care of that as an ‘atta-boy’ and knowing I wanted to run that race! Very happy to see the loss this week. 260 pounds puts me 5 pounds away from 100 pounds lost (355 to 255). I won’t hit that by my birthday next week, but that’s OK. At first it looked doable, but then I gained one week and kinda killed it, but it wasn’t a hard and fast deadline just was looking at 6 pounds to go with 3 weeks left it was there, but then gained almost 2 pounds put me behind the 8-ball. After wieghtlifting and then running and then yoga this weekend I am very tired and very sore. Not sure if I should double up or not. Thought about skipping yoga today, and it was very difficult, but the stretches were (I hope) good for me. 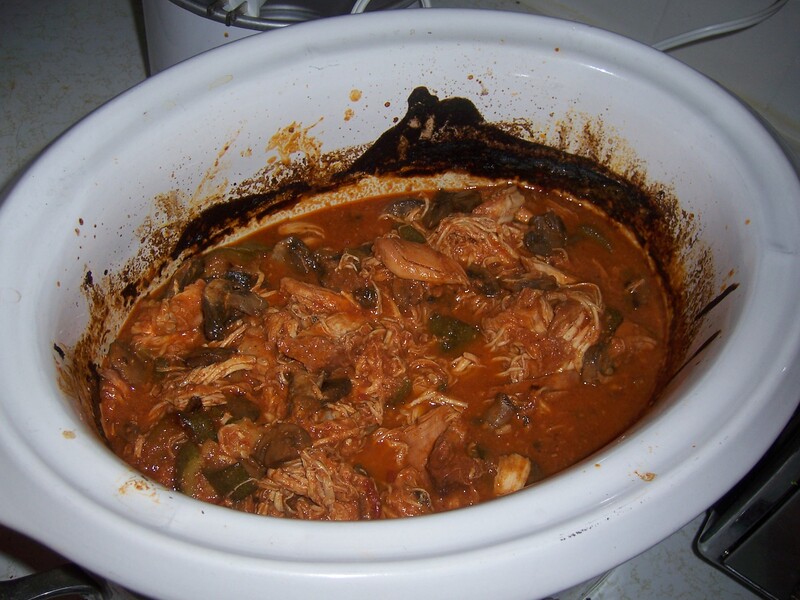 This is another recipe from my MFP pal Meaghan, and it’s my favorite kind of recipe… chop everything up and toss it in the crock pot and turn it on. The basis of this recipe is chicken and vodka pasta sauce. The veggies can be whatever you like. Since I had just had some Japanese food with grilled zucchini and onions I remembered that I did in fact like zucchini. The mushrooms were, well because I’ve been trying to add more mushrooms to things. They add a lot of flavor and texture and the pound of mushrooms I used was… what? 40 calories? Basically nothing. 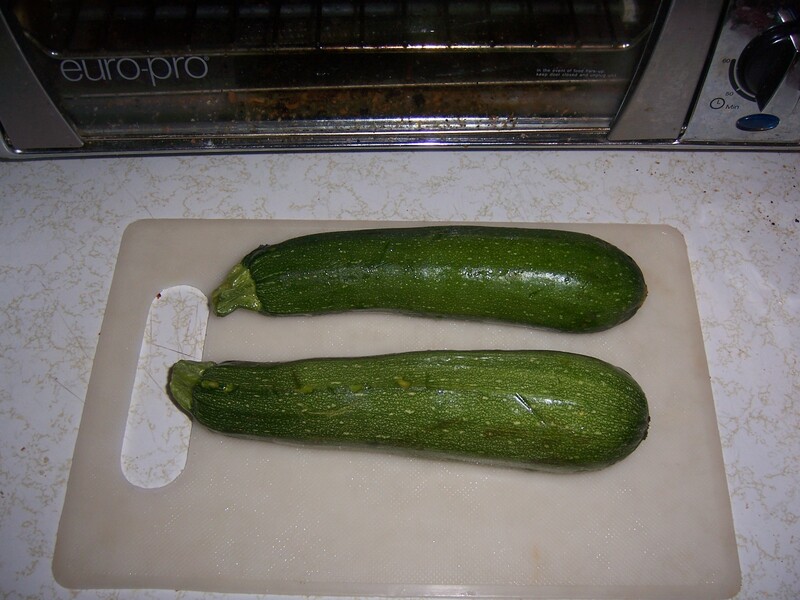 2 large zucchini (weight unknown). 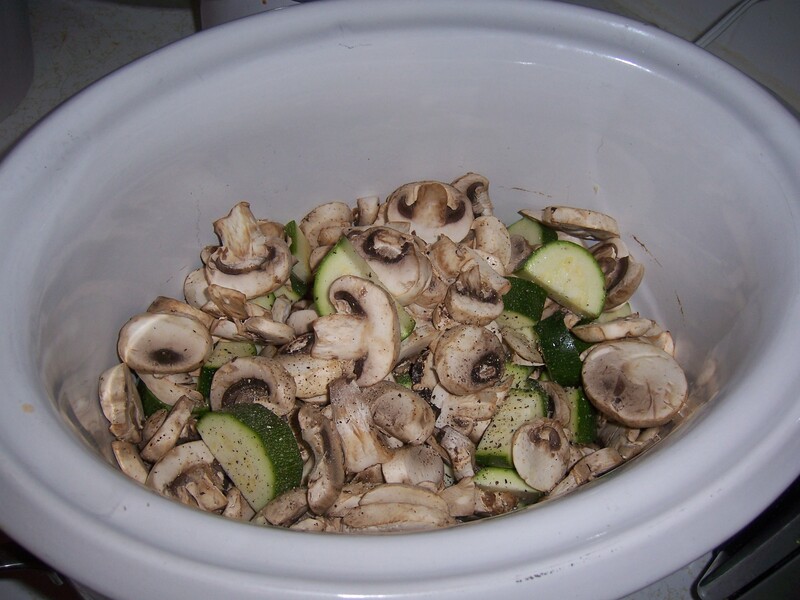 First I washed and chopped the zucchini and added it to the crockpot. Next I tossed in the mushrooms and wow did it look like a whole lot of mushrooms. I thought it was gonna be way too many, but of course they ended up cooking down quite a bit as mushrooms are wont to do. The zucchini is hiding in there somewhere. Seasoned the veggies with salt and pepper. Now the hard part (not really). Lay the chicken breasts over the veggies and pour on the sauce. 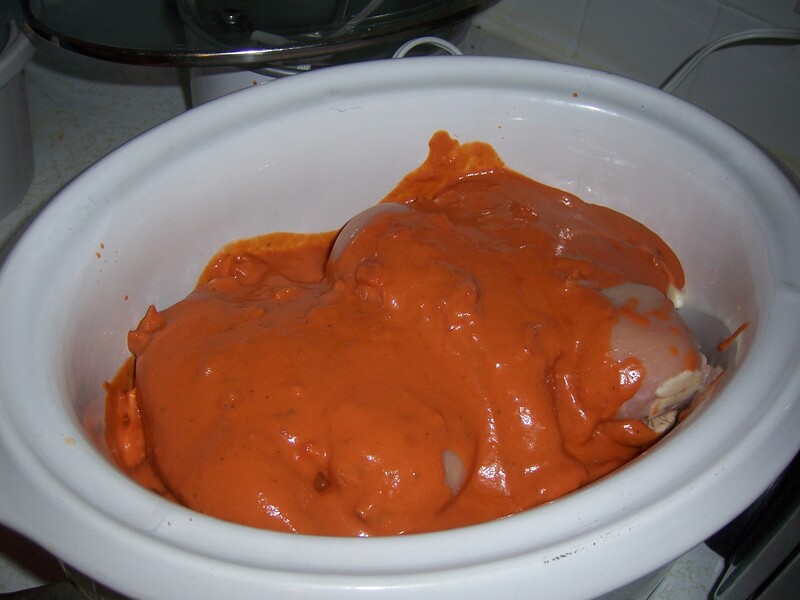 No need to cut the chicken since it will shred nicely after 10 hours in the crock pot. Slap on the lid, turn the crockpot to low and go to work! (or just let it cook all day). Ok, so even on low, mine was boiling away when I got home, kinda burnt on the sides and the zucchini basically disintegrated into mush. Neither of these affected the flavor, just texture. Not the prettiest dish I’ve ever made, but it was yummy. 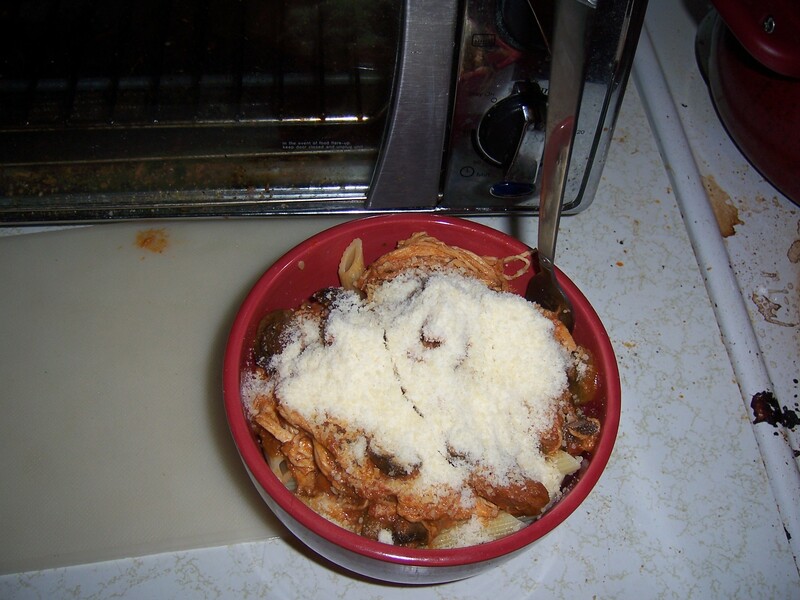 Toss on a healthy dose of Parmesan cheese and dinner is served!! Nutrition wise, this is not a bad dinner. I had mine with pasta, but it would be equally good with rice or by itself. This made 4 (large) servings. Add in 4oz of cooked pasta for an additional 400 cals – 84 g carbs – 2 g fat – 14 g protein So you can go high carb (pasta), high protein (chicken) or both! Cost wise this recipe isnt too expensive either, and will feed 4 (or in my case, one person 4 times). This week was an interesting week. I was gearing up for my 10K so I played around with my running mileage a little bit. I intended to do 4 on Tuesday and then 2 on Thursday, but Tuesday I had a work catered lunch and a wedding shower on the same day and running later than normal on a full stomach made me feel tired and nauseous. Managed to get in 3 miles and then called it a day. My race was good but BRUTAL. Very hilly course, but I ran the entire distance. Kind of surprised to see a lose this week with the way I ate, but also a little bit disappointed I’m having to lose back weight I had gained the week before. My race went well and I didn’t run nearly as slow as I felt like I was going, so I guess it was a good week! This morning I ran my second 10K and boy was it a doozy. I knew it was going to be hilly, since this was up in the foothills but wow, this made the St Leo’s course seem flat by comparison. 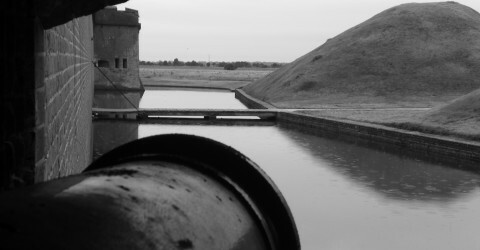 I carried my camera with me on the course, so this will be a very picture heavy blog. I got up early and hit the road since the race was about an hour away. Had to do my check in and packet pick up pre-race since I couldn’t come up the night before. They gave us a very nice tech shirt and a it has a cool logo on it. The said shirts were only guaranteed for the first 200 registered, so I was expecting a fairly small crowd for this race but I was wrong. My hopes of placing in my age division dashed before we even started. Found a nice stranger to take a pre-race picture of me. Ironically enough not a few minutes later another couple asked the same group of girls to take a picture for them, I guess they just looked friendly. Runners are awesome people. Sadly, if my coworker Carmen was there, I didn’t see her. Here we are waiting for the start. They had signs up for the different pace groups, and so I was back in the back with the 12 minute mile group, but I think most people just ignored that. I was in the back of the pack the whole way. Not that there is anything wrong with that. This is fairly early in the race, maybe a half mile in, can still see the crowd ahead of me. After a while I got to the point I was pretty much running alone. 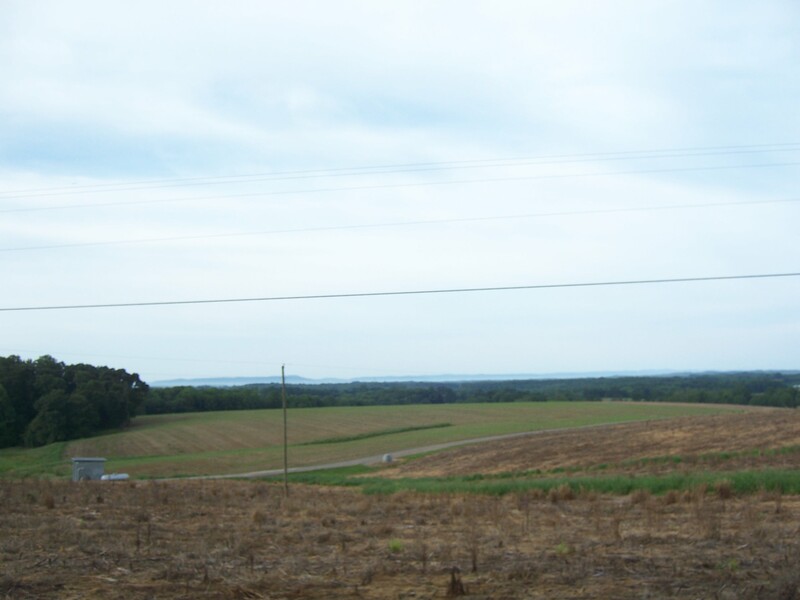 Don’t remember exactly where on the course this was (between mile 1 and 2 I think) but this was the view to my right……. And this was the view to my left. 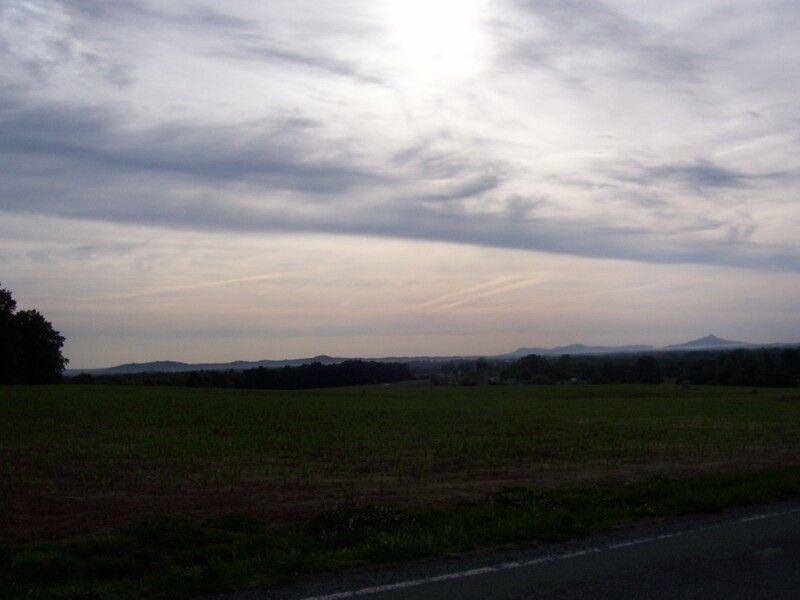 On the far right is Pilot Mountain in the distance. That’s what I was trying to take a picture off, but hard to center while running 5 miles an hour, at least I got it in frame. I didn’t take as many pictures the next couple of miles because the course started getting hard. It seemed like the entire course was uphill, even though the elevation map (and my Garmin afterwards) said it was more down than up, but it sure didn’t seem like it. A little bit before 3 miles we came to a portion of the course that cut into the vineyard, just a little shoot in and then turn around back out to the road we had been on. Well this was not an easy little shoot in, after the 3 mile marker and then getting up to the turnaround point was a HUGE uphill, very steep… I almost had to stop and walk but I willed myself to keep running. 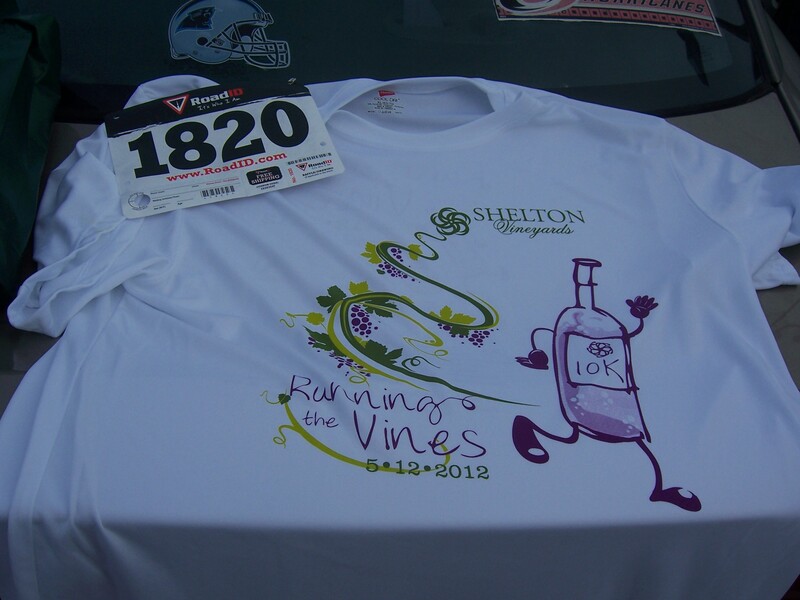 A nice close up of the race’s namesake vines. I believe these were Sauvignon Blanc, but I’m not 100% sure. The sign was on the other side of the road and they may not have been the same. From here to the end the course was pretty brutal. Miles 4 and 5 were mostly uphill. I was very very tired at this point, just had to keep putting one foot in front of the other and tell myself not to stop. After about 5.5 miles we turned back onto the main road for the winery and it was thankfully “all downhill from there”. 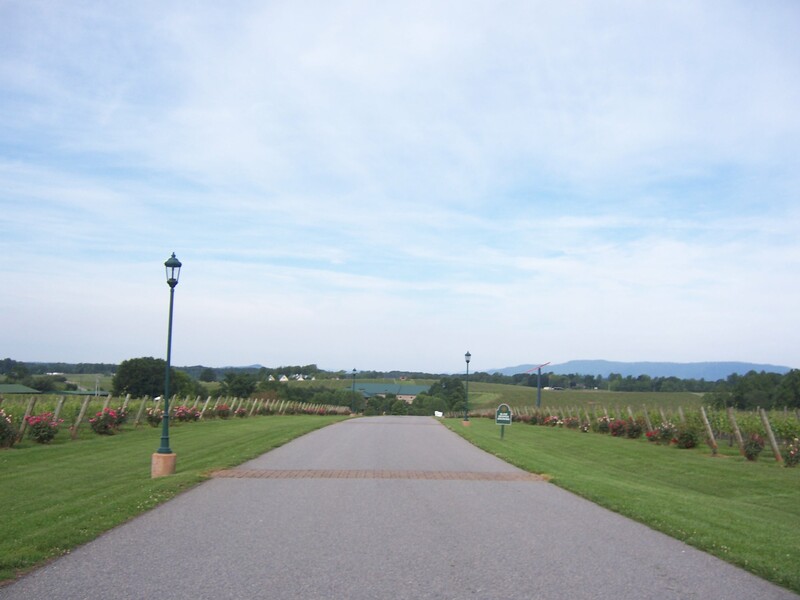 Entrance to the winery.. getting close! Six miles!! WHOOHOOOOO!!! ALMOST DONE! Rounding the corner to the finish… YAY! And what was waiting for me at the finish? 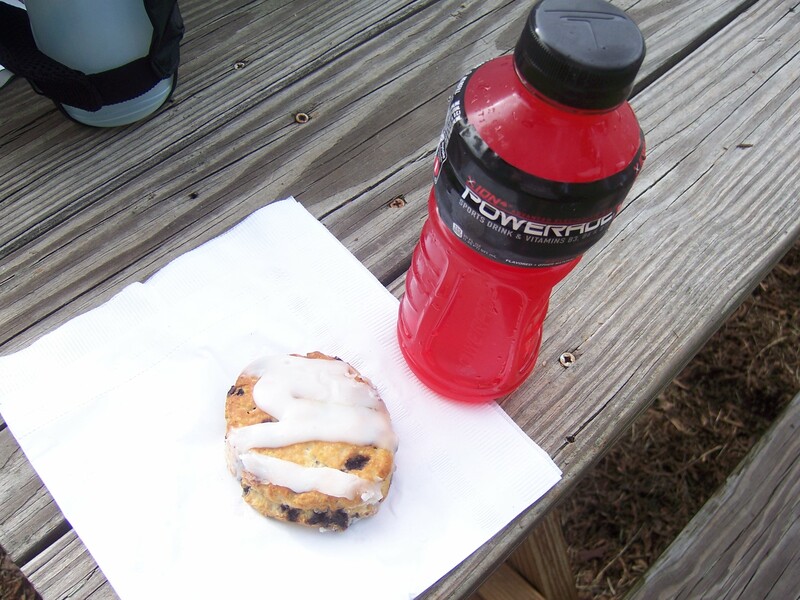 Screw a banana… a Bojangles Bo-Berry biscuit? Yes please!! I just burned 1230 calories, so I can has one. I’ve actually never had one of these.. I used to get the cinnamon biscuits all the time, but they don’t make those anymore. It was really good. So worth 300+ calories of post run recharge. So some stats from the race. As usual on a race day, I got caught up in the crowd and started out way too fast. So I was slowing down the entire time, no negative splits today. Got tired around 4 miles, and even though I kept a good overall pace, I felt slow and sluggish, but I guess that can be deceiving. My splits were: 10:55, 11:21, 11:34, 12:32, 12:43, 13:40, 11:17 (0.25). Overall pace of 12:05, which is not bad at all. About a minute a mile slower than my 5K PR pace, and actually faster than I expected to run this race in. I finished in 1:15:34 on my Garmin (Chip time 1:16:01). I don’t know why they bother with chips when they have a pad at the finish but not at the start, my last two races have been this way. Only “cost” me 30 seconds, and would not have effected my age group or overall place, but still. That delay from starting in the back could be huge! The overall ascent was 505 feet, the overall descent was 627 feet but it did NOT feel like it was more downhill than up. Somehow this is less ascent and descent than the St Leo’s race which really makes no sense. Surely this was hillier? Odd. Not sure how accurate this is, since it didn’t seem to make a lot of sense with my hike in the mountains either. Although this was a one way course and not an out and back, so we went up and down all the St Leo’s hills twice. 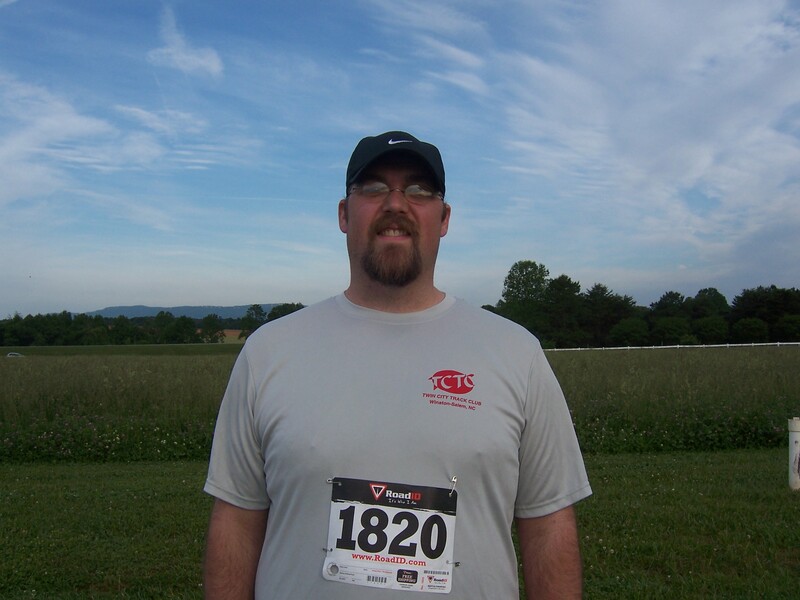 I finished 13th in my age group, out of I don’t know how many. I didn’t even look at my overall place, but I think it was in the 300’s. 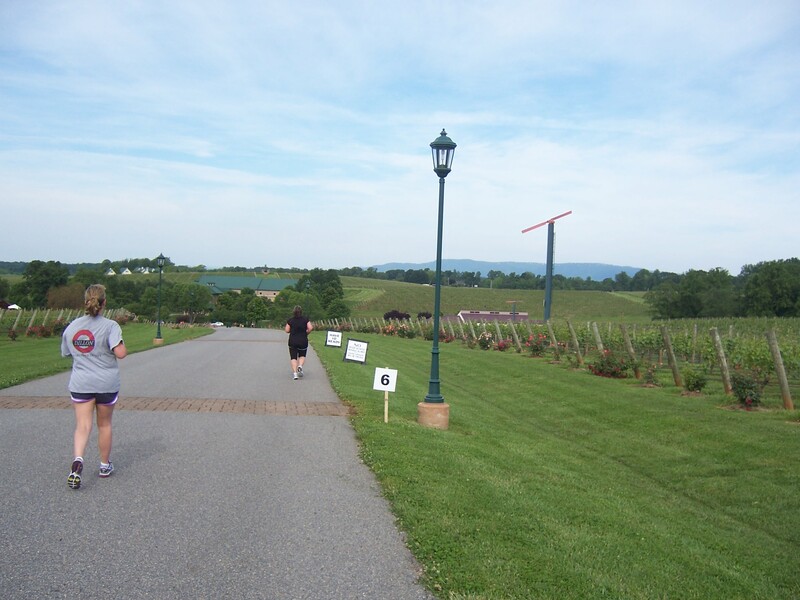 After the race I stayed to do a tour and tasting at the winery. The other two people on the tour didn’t seem to mind I was sweaty. 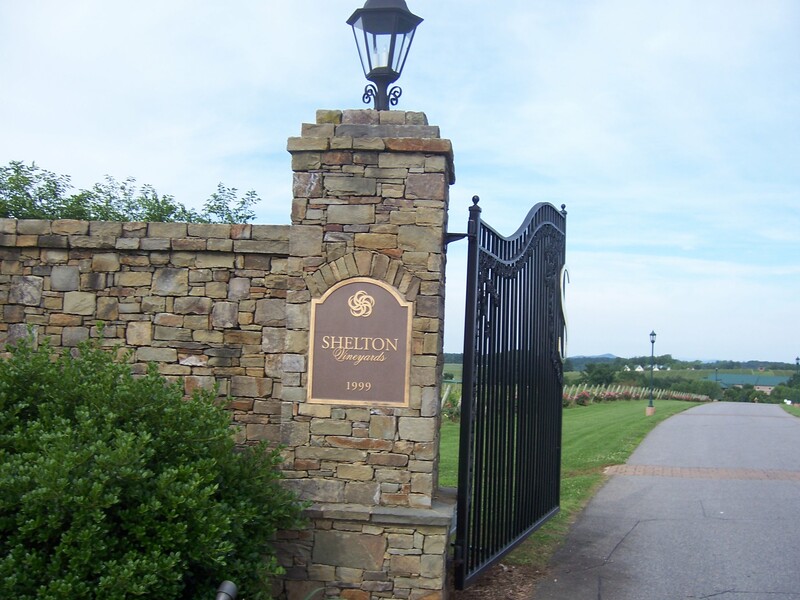 LOL I’m glad I stayed, since the last time I came here like 7 or 8 years ago, I was not at ALL impressed with Shelton Wines, in fact I would say I hated them. 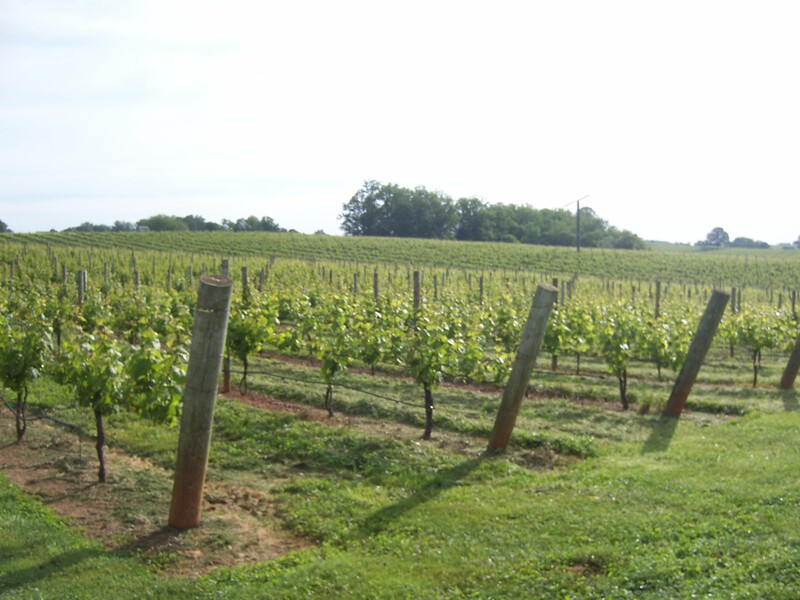 But I know my wine tastes have changed in the last few years, away from sickly sweet muscadines and more into dryer, crisper whites. The tour fascinated me as a food science person, I recognized most of the equipment. Unfortunately the bottling machine was not currently running, would have loved to see that in action. 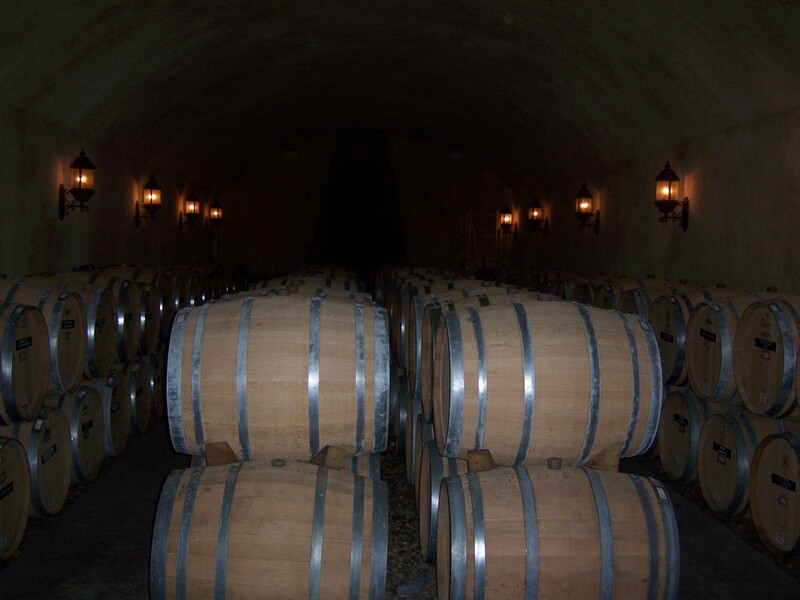 Not a great picture in the dark, but this was one of the aging rooms, called the “Wine Cave”. The Estate Chardonnay was aging in here. They had some older Riesling on sale for 6$ a bottle, and I had limited cash, so I bought two bottles of that, even though the newer Reisling was better, I could have only gotten one bottle, couldn’t pass up that kind of bang for the buck.